(ii) Separate instructions are given with each section and question, wherever necessary. Read these instruction very carefully and follow them faithfully. You were very upset about the reports on communal riots in various parts of the country. 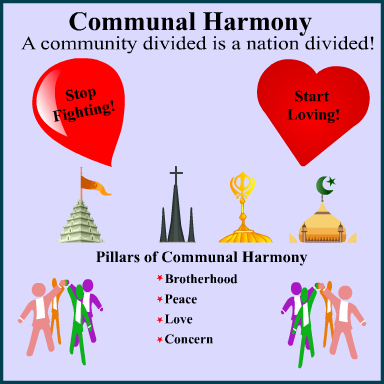 As a concerned social worker, design a poster in not more than 50 words, highlighting the importance of communal harmony. You are Vinay/Vineeta. The literary club of your school is putting up the play 'Waiting for Godot'. As secretary of the club, draft an invitation inviting the famous writer Sudeesh Gupta to be the guest of honour at the function. Write the invitation in not more than 50 words. You are Govind/Gauri. The students are putting up the play 'Waiting for Godot'. Your presence will encourage the students and make the occasion more meaningful. Last week the newly built auditorium of your school was inaugurated. As Deepak/Deepti Saha, the head boy/girl of the school, write a factual description of the auditorium in 125‒150 words. You had attended a workshop on personality development for students. Many eminent personalities had been present. Write a report in 125‒150 words on how the workshop proved to be beneficial. You are Rajesh/Rajshree. You are Anand/Arti of 14, Model Town, Delhi. You have seen an advertisement in The Hindu for the post of Chief Chef in a 5-Star Hotel. Apply for the job with complete biodata. Write in 125-150 words. You are Prem/Parul of 16, TT Nagar, Bhopal. You would like to apply for the post of Marketing Manager in a reputed firm in Mumbai. Write a letter to the Public Relations Officer, Chantac Enterprises, Mumbai, applying for the job. Write the letter in 125-150 words giving your biodata. Last week, as you were coming back from school you happened to see a huge plastic bag full of leftovers of food being flung into the middle of the road from a speeding car. You wondered how people can be so devoid of civic sense. Write an article in 125‒150 words on why we lack civic sense and how civic sense can be inculcated in children at a very young age. You are Shiva/Shamini. You saw a stray dog beaten to death by a group of boys. Their act infuriated you and you scolded them for their cruel act. You decided to write an article on cruelty to animals. Write the article in 125‒150 words. You are Nikhil/Naina. (b) Why are we 'despondent'? (c) What removes 'the pall from our dark spirits'? Children, these windows, not this map, their world. (a) Who are the 'children' referred to here? (c) How is their life different from that of other children? (b) What is the sadness the poet refers to in the poem 'Keeping Quiet'? (c) How are Aunt Jennifer's tigers different from her? (a) Why did Sophie long for her brother's affection? (b) Why did Edla plead with her father not to send the vagabond away? (c) What job did Saheb take up? Was he happy? (d) Why were the elders of the village sitting in the classroom? (e) Why did the Maharaja order the dewan to double the land tax? (f) Why did Roger Skunk go to see the old owl? (g) Why was Zitkala-Sa in tears on the first day in the land of apples? Why is the Champaran episode considered to be the beginning of the Indian struggle for Independence? What was the General's plan to get rid of the American prisoner? Was it executed? What traits of the General's character are highlighted in the lesson 'The Enemy'? Both Derry and Lamb are physically impaired and lonely. It is the responsibility of society to understand and support people with infirmities so that they do not suffer from a sense of alienation. As a responsible citizen, write in about 100 words what you would do to bring about a change in the lives of such people. Why did Dr. Mortimer need the services of the detective Sherlock Holmes? Answer in about 125 words. Who is Laura Lyons? What confession did she make to Sherlock Holmes? Answer in about 125 words.